Modeling Volcanoes – When will they erupt? A recent post by the excellent Maths Careers website looked at how we can model volcanic eruptions mathematically. This is an important branch of mathematics – which looks to assign risk to events and these methods are very important to statisticians and insurers. Given that large-scale volcanic eruptions have the potential to end modern civilisation, it’s also useful to know how likely the next large eruption is. The Guardian has recently run a piece on the dangers that large volcanoes pose to humans. 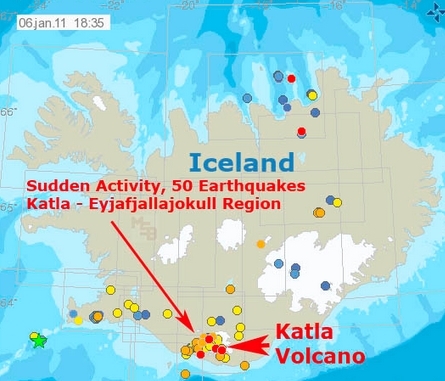 Iceland’s Eyjafjallajökull volcano which erupted in 2010 caused over 100,000 flights to be grounded and cost the global economy over $1 billion – and yet this was only a very minor eruption historically speaking. 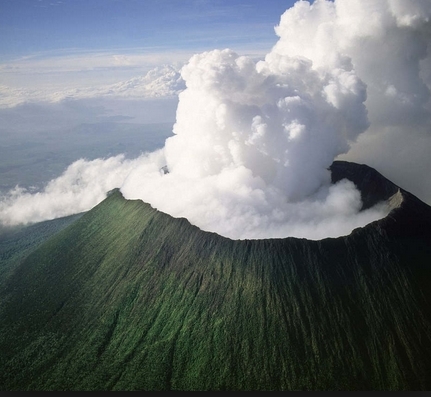 For example, the Tombora eruption in Indonesia (1815) was so big that the explosion could be heard over 2000km away, and the 200 million tones of sulpher that were emitted spread across the globe, lowering global temperatures by 2 degrees Celsius. This led to widespread famine as crops failed – and tens of thousands of deaths. Even this destruction is insignificant when compared to the potential damage caused by a super volcano. These volcanoes, like that underneath Yellowstone Park in America, have the potential to wipe-out millions in the initial explosion and and to send enough sulpher and ash into the air to cause a “volcanic winter” of significantly lower global temperatures. 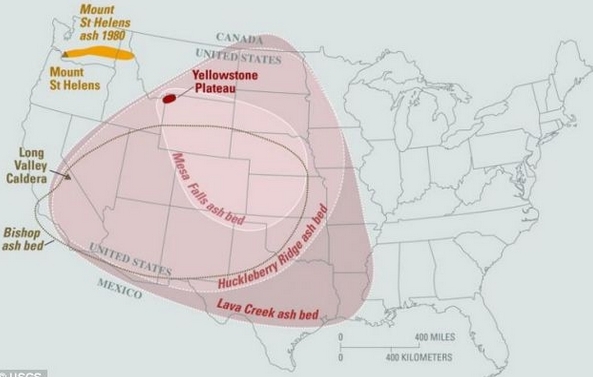 The graphic above shows that the ash from a Yellowstone eruption could cover the ground of about half the USA. The resultant widespread disruption to global food supplies and travel would be devastating. This formula calculates the probability that X equals a given value of k. λ is the mean of the distribution. If X represents the number of volcanic eruptions we have Pr(X ≥1) = 1 – Pr(x = 0). This gives us a formula for working out the probability of an eruption as 1 -e-λ. For example, the Yellowstone super volcano erupts around every 600,000 years. Therefore if λ is the number of eruptions every year, we have λ = 1/600,000 ≈ 0.00000167 and 1 -e -λ also ≈ 0.00000167. This gets more interesting if we then look at the probability over a range of years. We can do this by modifying the formula for probability as 1 -e-tλ where t is the number of years for our range. So the probability of a Yellowstone eruption in the next 1000 years is 1 -e-0.00167 ≈ 0.00166, and the probability in the next 10,000 years is 1 -e-0.0167 ≈ 0.0164. So we have approximately a 2% chance of this eruption in the next 10,000 years. A far smaller volcano, like Katla in Iceland has erupted 16 times in the past 1100 years – giving a average eruption every ≈ 70 years. This gives λ = 1/70 ≈ 0.014. So we can expect this to erupt in the next 10 years with probability 1 -e-0.14 ≈ 0.0139. And in the next 30 years with probability 1 -e-0.42 ≈ 0.34. The models for volcanic eruptions can get a lot more complicated – especially as we often don’t know the accurate data to give us an estimate for the λ. λ can be estimated using a technique called Maximum Likelihood Estimation – which you can read about here. Black Swans and Civilisation Collapse. How effective is maths at guiding government policies? Even if we have data, how sure can we be that the events would follow a regularity? An eruption depends on so many factors and we may not have resources to understand & estimate each one’s impact for the culmination of the event. Further, it is generally futile to go by probability when we are faced with binary situations where 1 or 0 may ruin us completely. Even in the financial world, many Nobel laureates applied probability theory to make well sounding financial models.. It didn’t have any meaning when firms with a 2% chance to fail precipitated into the 2%, making a mockery of those with those statistical tools and investors were hit very hard. What is the point in trying to predict an event that may or may not happen in 600,000 years? This may be obvious, but I am having trouble understanding why this gives you the probability it will erupt in the NEXT 10 and not just in a given/random 10- year range. Can you explain?